We offer 300 holes manual capsule filling machine in complete stainless steel material. In this manual capsule filling machine model, the empty capsules are to be loaded manually in the filling tray and all other processes are also to be done manually. There are different capsule size ranging from 00,0,1,2,3,4,5 for which this machine is suitable. Capsule Size 00,0,1,2 can be done on the same machine with the help of change parts. Capsule size 3 and 4 can be done on the same machine with the help of change parts. For capsule size 5, a separate machine is prepared. The machine is provided with highly finished stainless steel surface and also all parts of the machine are Stainless steel constructed. Machines can be provided with different grades of SS material like SS304 / SS316 or SS316L. We provide the premium quality mirror finish and very precise locking of the capsules in our manual capsule filling machine. Our manual capsule filling machines are worldwide accepted with ample of clients operating the machines worldwide. The machine is designed and constructed by qualified engineers with good quality material and products which give best quality output and least breakdowns. 300 holes manual operated complete stainless steel capsule filling machine. Available with SS 304, SS 316 and SS 316L contact parts. 1 no top section plate provided. 3 no's. capsule loading tray provided. 1 no. Nylon Brush provided. 1 no. Teflon Scrapper provided. The Machine is rested on 4 no's legs. A Complete machine in SS 316 or SS 316L. Hand Glows while operating the machine. Approx. 6000 capsules/hour depending on the skill of the operator. No Electricity is required for this machine as there are no electric or electronic components provided. Aprrox. 12 x 17 x 19 inches. 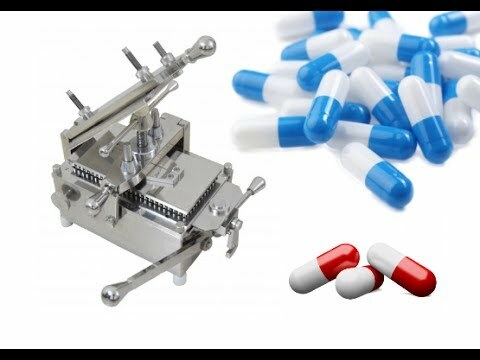 I would like to enquire about KI-MCF Manual Capsule Filling Machine .